I'm always a big fan of basic seasonings. Chicken's probably the toughest meat to figure out... finding seasonings isn't difficult, but finding the perfect combination is. The best results I've had is with McKormick's Montreal Chicken Seasoning. Slightly sweet and salty, I'll sprinkle a good portion on the chicken breast. Spray a little cooking spray (or coat with canola oil) to seal everything in. Apply heat. Personally, I try to steer away from marinades. My experience has been that marinades tend to dry out the meat and overpower it with flavor. I also avoid acidic seasonings (lemon juice) for the same reason. I too had bland breasts until I remembered some Jamaican Jerk Season Ihad had laying around for quite a while. Chicken, especially the breast cut, can easily be made to taste like card boardif your not careful. So, I first rubbed lousiana hotsauce on my boneless, skinless, split chicken breasts, then rubbed the jerk seasoning on and then a light sprinkle of salt. Let them sit for about 30 minutes and then grilled on my gas grill. I served them with just a light brush of Hoy Sin Sauce to give a slight sweet taste but too much Hoy Sin will over power the flavor of the jerk. I find that brining my chicken for a few hours helps tremendously. Just mix 1/2 table salt into 4 quarts water until dissolved. Submerge the chicken in the water (in a bowl, pot or plastic bag) and refrigerate. I don't brine fr more than 8 hours because the chicken gets too salty on the inside for us. We like a subtle saltiness. The brining will also help keep the chicken moist and tender (to avoid cardboard texture). Wash the brine off before using - or leave it on for a saltier exterior. Michael you beat me to it! I was also going to suggest brining. You can add other things to your brine as well...a touch of sugar (1/2 the amount when compared to salt), like salt, will enhance flavour. In addition to sugar, you can add some slices of ginger and peppercorns to your brine to add some additional flavor. I really need to get hopping in my kitchen to post more kitchen adventures! Buy the best tasting chicken that you can find. That'll entail getting samples form the various stores and butcher shops in your area and seeing who has the best product. I have typically found that butcher shops tend to have the best meat (no kidding). If you have a local source of high quality free range chicken, I'd go with that. Just because something is called free range or organic doesn't mean it's a superior product, but if it is a quality operation their birds will have a varied diet and plenty of exercise which will result in better eats. When cooking, don't overcook the meat. While this sounds simple, in reality it can be difficult, especially for a neophyte. Learn how to judge the doneness of meat by pressing on it (undercooked chicken will feel mushy, properly cooked chicken will be springy, overcooked chicken will be hard), or if you are not comfortable judging doneness by touch, buy a good meat thermometer and remove the chicken while it is ~5 degrees undercooked. It will finish cooking from the residual heat as you let it rest for a few minutes. And the final point is the resting of the meat after cooking. All meats that are grilled or roasted benefit from a rest period. This allows redistribution of the juices within the meat, resulting in a more flavorful dish. 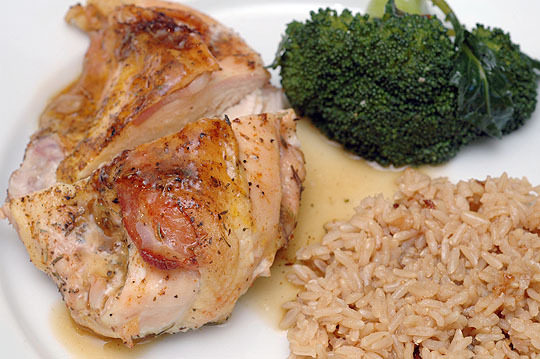 A chicken breast need only rest a few minutes - 5 minutes is tops. Yum, chicken breast. NO skin? Awwwww, naked chickies. I usually rub with extra virgin olive oil, sprinkle with kosher salt and tuck a piece of bacon under the skin. Then sprinkle a little Old Bay seasoning over all, or anything you guys listed above. Call it anything you want, but don't call it bland! Rub it on the breasts, toss them in the fridge for between 1/2 hour and 6 hours, then grill them up. The outside will turn black, and you will want good ventilation since all the peppers get into the air and can sting your throat when you breath, not to mention the smoke. This is also good on rotisserie chicken. Bufalo Chipotle sauce is pretty fine on chicken. Aussie Women's Weekly Thai cookbook has a very nice sate marinade that works wonders on chicken and really requires almost no time. Ingredients: garlic, brown sugar (I like kecap manis), fish sauce, coriander, cumin, curry powder, sambal oleak (usually go with sriracha). Can't really go wrong with coconut milk to baste with. Taste of Thai peanut sauce mix and rice and you're on your way. Lebanese marinade using lemon, garlic, parsley a winner as well. Vietnamese marinade is complicated, but worth the effort. Pulped up onion and homemade spiced wine are key ingredients. The rest of the mix is sort of like the sate marinade without the cumin. Seems to need a couple days to work. Me old dad's killer gas grill chicken takes a whole bird, splits it, dries the skin with paper towel, and seasons with season salt and pepper. Cook on low on top shelf with a drip pan under to keep from flaring up. Hour and a half and it's perfect, with crisp skin. I marinate in a vinegar and olive oil mixture with salt/pepper/garlic thrown in. I usually let it sit over night then toss them on the grill and brushed with a homemade bbq sauce. If I'm in a hurry then I'll substitute a store bought BBQ sauce and mix in a spoon or two of adobe pepper sauce to spice it up a little. The chicken breasts are cooked for 4 minutes per side on medium (on a webber grill) and brushed with the sauce twice per side. I fourth (or is it fith now) on brining. Being a overworked and lazy cook I combine thawing and brining. I put frozen breasts (from Costco, not the best chicken but it is handy) in a Pyrex dish with water, some salt and maybe a little sugar. I set it in the sink with just a bare trickle of water into the dish to create come convection. By the time the chicken is thawed it has picked up a little flavor and moisture. Not the same as brining a good bird (or buying kosher to begin with) but it does help a lot. The running water also floats out a lot of the nastiness that comes off the meat as it thaws. Have you tried thighs instead of breasts? Much better flavor, IMO, and harder to overcoov. Got a tip and tried something new this weekend. After brining the Chicken breast as per the instructions on this web site, I then marinated the breasts in Cardini's Original Ceasar Dressing. This dressing is very common around here and available in all the local grocery stores. Anyway, I let the breats sit in the Cardini's for about a half hour, then grilled on the gas grill and they came out with creamy taste that went very well with the slight smokey aroma the grill gave it. I highly recommend this method for boring, bland chicken. Marinate the chicken for a couple of hours in your favorite italian dressing, then grill. Coat with Famous Dave's Texas Pit BBQ sauce (I dunk mine in a bowl of the stuff) and grill at low heat. I coat our chicken(mine and my wifes) again when it's almost done, the kid's chicken doesn't get the extra coating. The sauce is like no other IMO.